Experience of reception in seasonal hiring since January 2016 is more than 3 years + of 700 stays realized in Tours and Damgan, no cancellation after reservation, it is a guarantee for our travelers! We have created our brand, ESCALE IDEALE early 2018 to gather all of our cottages: So Breizh Villa in Damgan, So Cozy Apartment, So Cocoon Apartment and So Cute Apartment in Tours. Ideal for groups, families, pros or couples! Warm welcome guaranteed !!! Possibility of late arrival in the evening, home assured. So Breizh Villa is a neo Breton house of 140m ². Rare level of benefits ... The environment is perfectly calm, the house is in a private cul-de-sac! You can take the footpath that will take you 400 meters further ... to the great beach of Landrézac! Do you hear the sound of the waves in the distance? It is possible according to the coefficients of tide !!! The house has been completely renovated in 2016, which allows to benefit from a very beautiful surface. The 2 floors have been conceived and designed so that they can function independently, which can be significant for large groups that may need to be broken if the rhythms of life are different. On the ground floor, you will have 70m² with 2 closed bedrooms. The large bedroom with double bed is equipped since January 2018 with a home theater with projector and soundbar of excellent quality! The kitchen / dining room is fully equipped and functional. You will have a large table to accommodate 12 people (maximum). The living room also allows everyone to find their place comfortably. On the ground floor, the light is through all day. Just leave the doors open and enjoy the sun from morning to night. The floor includes a large living room (mezzanine / room No. 3 open) equipped with a small kitchen serving as "bar area" with all the necessary equipment and 2 closed rooms. Each level has its separate toilet and its bathroom or shower room. 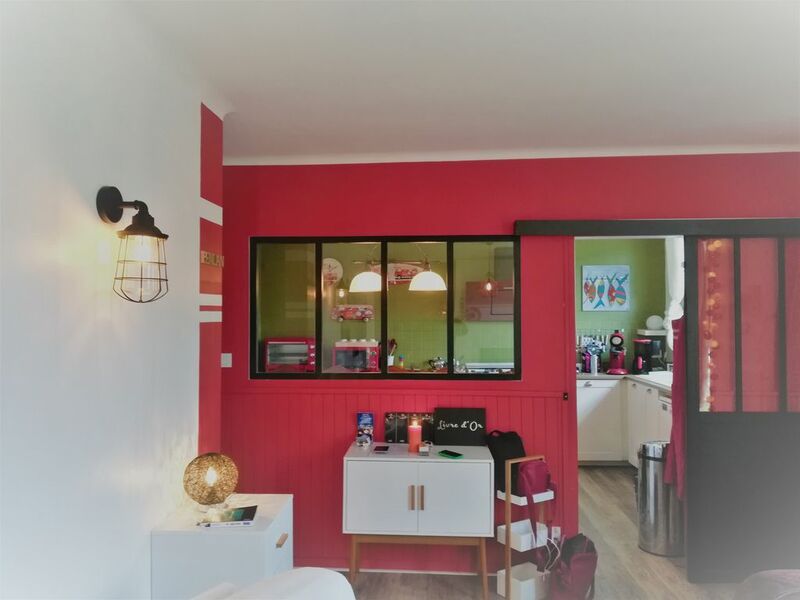 You will also enjoy a small lounge with TV (TNT channels and possibility to connect your game console in Scart or HDMI, DVD player) and finally a sleeping area with 2 beds Bed loft (+2 beds not listed but possible in BZ). You can use the speaker column Bluetooth to broadcast your audio or cable Jack connected to the amp Harman Kardon and Infinity speakers of excellent quality (source CD or Video 4)! The room is large, it measures 25m², it's a living room as the photos show. Room 4 has been designed for children, but disregarding the decoration, it can also be suitable for adults. It has a double loft bed, a single loft bed and a single bed on the floor, or 4 beds! The advantage of the mezzanine beds is to leave the floor space free for games! Finally, the 5th bedroom of approximately contains a double bed and is also used as a movie theater! It is equipped with a high quality projector (BENQ) and a BOSE home cinema! You can watch the channels of the TV Free (200 channels available) or your movies from your USB key (or external hard drive) connected to the box or from your smartphone / tablet connected to the Chromecast 2 available connected to the projector in large format! The quality of the image and the quality of the sound are breathtaking! The decline of about 6 meters allows to better appreciate this installation from the 4 chairs. The floor is extremely bright with large roof windows including blackout blinds for the night in each room. We made sure that travelers feel at home with very different atmospheres and themes in each room, not forgetting that we are by the sea ... The house is really cozy and warm, summer and winter. We welcomed with great enthusiasm the installation of a wood stove for cooler days! Some logs will be offered to start your stay if you retain this option and we will offer you to buy more if you wish to continue with this level of comfort (in the limit of our stock built in early fall) ! Each level has its own hot water tank 200L or 400L helpful to not miss. During the heated period, between October 1st and April 30th, we will conduct a meter reading together, the costs related to the use of energy (except gas) being borne by travelers (around € 0.13 per person). kwh in off-peak hours between 22:30 and 6:30 and 0,16 € in Full Hours). You will have WiFi access and FREE UNLIMITED broadband in every room of the house !!! The installation is made by a professional company 2isr in accordance with the law, no discomfort on the use (assistance reachable during the day if necessary). Depending on your needs or desires, you can also use the printer GRACIOUSLY available with ink cartridges and paper supplied (usb cable and installation drivers are also provided). It is a new CANON printer that provides printing, scanning and photocopying functions. We will give you the best welcome, first with a smile, followed by sweets and refreshments. Depending on the seasons and times, you may be welcomed by our parents, Carmen and Gilles, who are equally attentive to your comfort. Accustomed to seasonal rentals, we rent 3 apartments in Tours and we do our best to satisfy travelers who choose the warm welcome and the many services that we offer. We invite you to consult the comments of the travelers who tried the experiment before you, in Damgan or Tours! You will have the whole house with parking next to the garage for 3 large vehicles! However, we kindly ask you to indicate the exact number of people expected for the stay, the amount of the reservation depending on the number of people. We are committed to accompany you throughout the stay at your request. You will be welcomed by our family living in Brittany and we keep the relationship management at a distance. Everything has been thought of for your comfort and for your stay in Damgan to be unforgettable! We also offer paying options: bed linen, bath linen, end of stay cleaning, firewood. The maintenance of the house during the stay and end of stay is up to travelers. Everything necessary will be made available (vacuum cleaners, cleaning kit and soil health, detergents etc.) on each floor for your comfort. The house must be returned in the same state of cleanliness as at the entrance to the premises (except final cleaning retained, the house must still be returned in a proper state of course). A security deposit of 800 € will be requested upon arrival and a rental agreement will be established after validation of the reservation. Looking forward to meeting you in Damgan! nous avons passé un agréable Week-end dans cette agréable maison tout équipé. Nous nous sommes sentis comme chez nous, la décoration est cosy, on se sent tout de suite bien. Merci aux propriétaires. Nous prévoyons d'y retourner mais plus longtemps ! Rien à redire tant sur la qualité de la prestation que sur l'amabilité des hôtes ! Une adresse à conserver pour un prochain séjour ! Un chèque de caution de 800€ (ou espèces) sera demandé à l'arrivée. Il ne sera pas encaissé et sera restitué après l'état des lieux de sortie. Consommation d'électricité/chauffage à la charge des voyageurs entre le 1er octobre et le 30 avril.